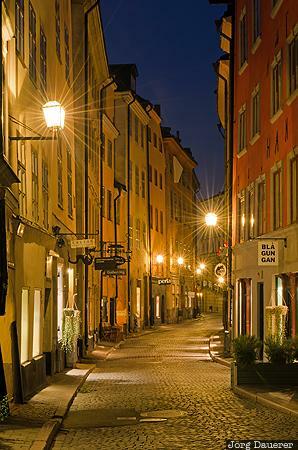 A typical alley in Gamla stan (The Old Town) located on the island Stadsholmen in Stockholm illuminated by street lights seen at the at the blue hour before sunrise. The star-burst effect seen around the illuminated street lights was created by stepping down the aperture to f16. Stockholm is in Stockholms län, Sweden. This photo was taken in the morning of a sunny day in September of 2014. This photo was taken with a digital camera.